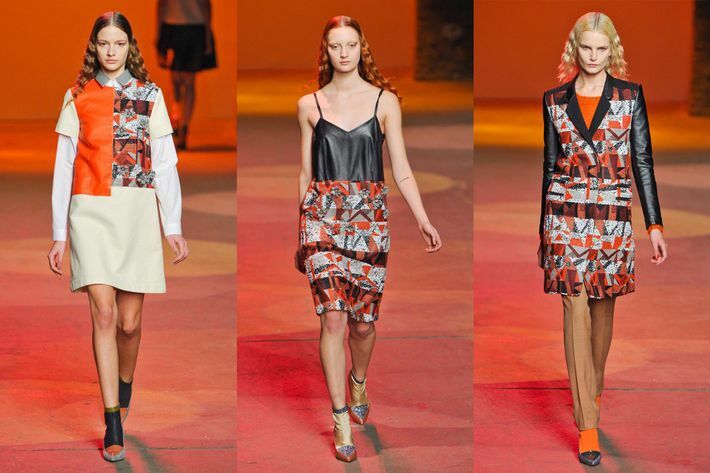 Creatures of the Wind’s excellent fall 2013 show featured several standout moments, but the most graphic highlight was custom hand-knit jacquard pieces in a black, white, and red palate. To get the look of the patterns, which were inspired by the Memphis art movement, I used a little tasteful sponge-painting and bright-red tape cutouts to create sharp graphic lines. Tools You’ll Need: Deborah Lippmann Ridge Filler Base Coat, OPI Alpine Snow, Covergirl Outlast Black Diamond, Sally Hansen Complete Salon Manicure All Fired Up, Deborah Lippmann Addicted to Speed Topcoat, Tweezers, Kitchen Sponge, Tin Foil, Scotch Tape, Scissors. Length of Time Required: 20-30 minutes, based on drying time. Step 1: Begin with a base coat. The Deborah Lippmann ridge filler base coat creates a nice even canvas for your design. Step 2: Two coats of Alpine Snow become the beginning of their hand-woven black and white jacquard fabric. Step 3: Place a drop of your black polish onto a piece of tin foil (or a tray). Cut off a small corner of a kitchen sponge (a kitchen sponge is porous, while a makeup sponge is too dense) to dab into the black polish, pat off excess polish on the tin foil, and dab the sponge on your nails. I use tweezers to hold the sponge for extra control. Cover the nail fully with black, leaving white visible beneath. Step 4: Use the same sponge with slightly more paint to create darker lines across each nail. The lines should vary from horizontal to diagonal. 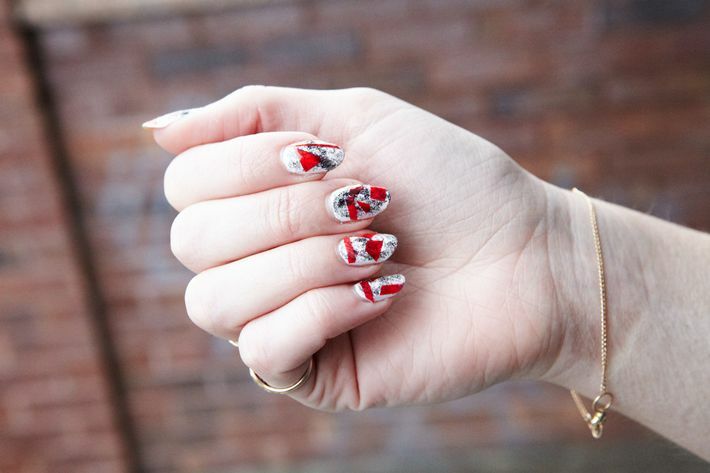 Step 5: Paint a few strips of Scotch tape with your red polish and let dry. Step 6: Once dry, cut the tape into small triangles and trapezoids and carefully place onto your nail using tweezers. Step 7: Finish with a topcoat. 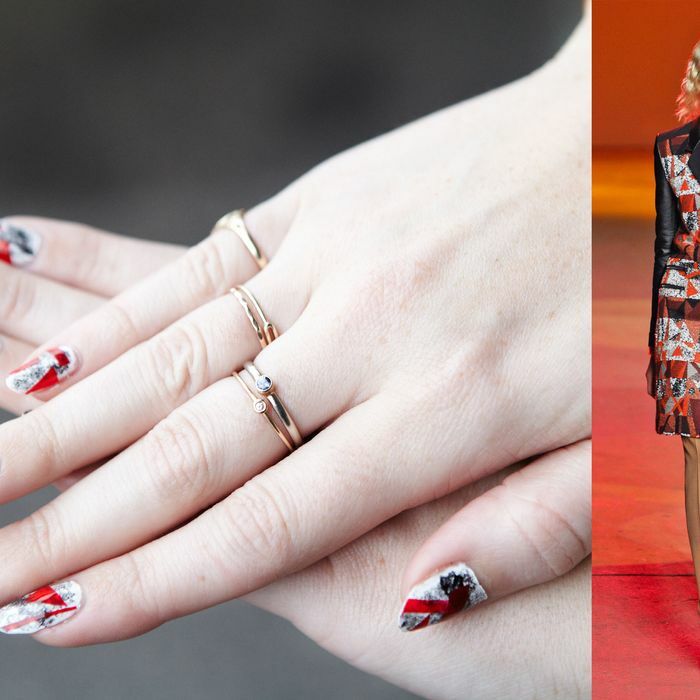 All this week on the Cut, Elizabeth Monson, of the blog MoveSlightly, will be creating custom manicures inspired by some of the most beautiful looks on the New York runways.